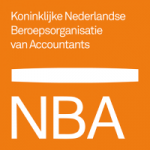 accountancy aan de amstel is an Amsterdam-based audit firm that is affiliated with the NBA. The NBA is body governed by public law, appointed by the government to represent the general interests of the AA profession and bound by law to ensure that the profession is practised properly. An AA-accountant is an internationally recognised accountant comparable with the English Chartered or Certified Accountant. An AA-accountant specialises in small and medium-sized enterprises. accountancy aan de amstel serves a variety of medium-, and small sized enterprises, as well as director/shareholders and wealthy individuals. We offer a complete package of services in the field of accountancy, business support, tax advice and administrative services. Practical solutions, pro-active thinking, equality, respect, openness and trust are qualities which you can expect from us. We thrive to serve you the best way, with a personal approach. Feel welcome to take a look at our website for more information or contact us for tailored information.